Tahiche Lacomba, General Manager of Frescamar Alimentación, received the Award Alimentos de España 2016 in the Fishing and Aquaculture Production Category this week in Madrid handed by the Ministry of Agriculture and Fisheries, Food and Environment, Isabel García Tejerina. During her speech Tejerina emphasized the importance of producing, offering and divulging the quality and diversity of Spanish foods inside and outside of our frontiers and, in such context, she referred to Frescamar as a company with great future in the breeding and transformation of aquaculture species which pursues innovation. The great development of the company regarding the production of corvina and the awards received by Corvina REX Frescamar for its organoleptic qualities were also other aspects of the company’s background which were highlighted. This award confers recognition to the company’s contribution to the promotion of aquaculture products and to the improvement of its image and position in the market, among others. 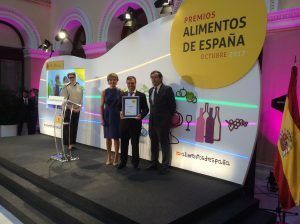 Along with the category in which Frescamar has been awarded, there were also other awards presented in the same ceremony: “Food Industry”, “Organic Production”, “Internationalization”, “Best Ham”, “Best Wine”, the special prize “Spanish food Awards to Entrepreneurial Initiative “and the” Extraordinary Spanish food Awards “. Also, during the ceremony the best extra virgin olive oils of the 2016-2017 campaign were awarded. We take this opportunity to congratulate all the awardees.